LG hopes to change the way people think about their home cinema set-up with the launch of its new Laser-based Illumination system at CES 2013. The Hecto system comes with a 100-inch Laser TV display and an Ultra Short-Throw projection unit, capable of projecting full HD 1080p video from just 22-inches away. This means the projector can be placed close to the display, near the floor, rather than screwed to the ceiling at the back of the room, which could be a boost for those homes or offices operating in more confined spaces. 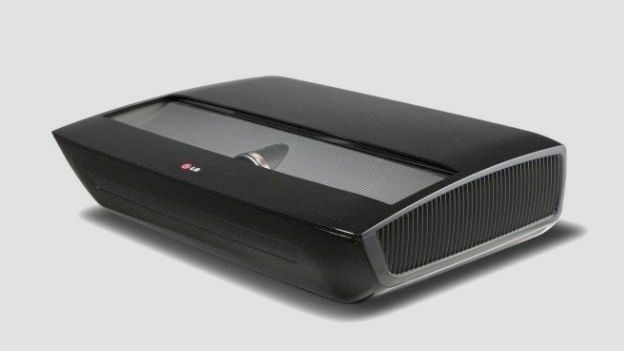 The Wi-Fi enabled projection unit also brings Smart TV and Digital TV functionality, has 3 HDMI ports, a 10w speaker and an audio out, and will come bundled with LG's fancy Magic Remote. The company did not reveal exactly when Hecto would be going on sale, but we'll get our first look at CES 2013 in the second week in January. Check back for a hands on review.